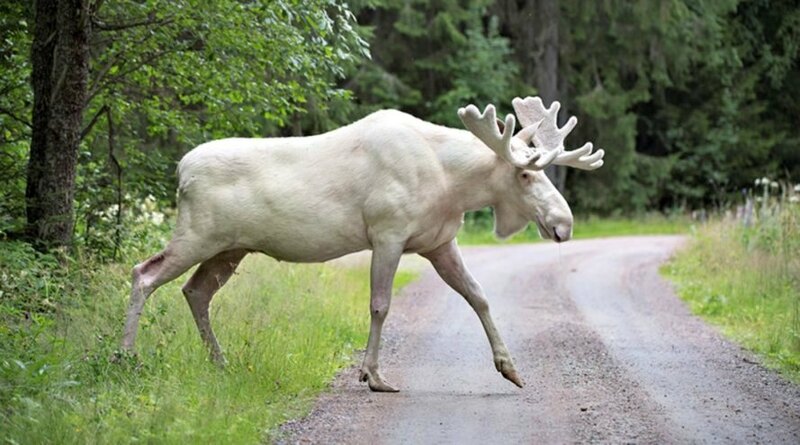 The rare appearance of a white moose is being celebrated by animal enthusiasts worldwide, as the majestic animal is estimated to be one of just 100 living in Sweden. Hans Nilsson, who has been tracking the elusive creature for three years, captured the footage on August 11 in the province of Varmland. As soon as it was uploaded, the video went viral. The BBC reports that the white moose is not albino but lacks color due to a genetic mutation. True albino animals are unable to produce melanin and have pink or red eyes. Animals with leucism, on the other hand, have a snowy white coat and dark-colored eyes. Moose are extraordinary animals, standing approximately 6.5 feet high at the shoulder. Some moose can weigh up to 1,800 pounds, and males have massive antlers that can span up to 6 feet end to end. Moose can also run up to 35 miles per hour. Unicorns sadly remain fictional, but at least white moose are real. The rare appearance of a white moose is being celebrated by animal enthusiasts worldwide, as the majestic animal is estimated to be one of just 100 found in Sweden.